Mediator is design pattern that is primarily used to loose coupling between components in their communication. For instance, if each of components would communicate to each other directly, we could get a complex net of communication lines between these components. Instead of direct communication we are using mediator who will be intermediate component for inside communication between components. Simple scenario for mediator role would be to gather messages from each component (component is in some books referred as Colleague), and than mediator would broadcast that message to all other components. In the next image we can see UML class diagram showing us dependencies between classes in implementation of Mediator pattern. Mediator and Component can be either abstract classes or interfaces, depending of the specific implementation. Now, there is a question, since mediator using broadcast, how each of components would know that the message is intended just for her. Well, in most cases message contains a key value that would be known to the receiver and sender, and it will be used to determine the originator and receiver of the message. There is also possibility to send sender and recipient information within the message. So, when the message is received by some component, component can determine if the message is intended for her or some other component, in that way message can be processed or ignored. From the security side, this is not very safe way to distribute all messages as a broadcast, but if implementation is not restricted with security rules (for example, UI classes) than it can have a good purpose to decouple communication between components. In this blog I’ll demonstrate simple chat application written in Java. Application will contain three tabs (three components, i.e. Colleague), and each of the tabs will be able to communicate with other tabs over the Mediator. For the message representation I’ll implement Intent class which instances will be able to contain string messages. Of course, current implementation of Intent can be extended and used to wrap other object types in a message as well. Source code from demo project can be downloaded from here. Now, let’s take a look at the code. This is simple Mediator interface that will be implemented in the Mediator class. Class Mediator implements previous interface with two methods. Method addComponent is used for registering components, since the Mediator needs to know all actors of communication. Second method, send, simply broadcasts message to all of the components, except sender component. In the next code preview you can see Component interface that will be implemented in Component classes. As you can see in the Component implementation, each Component contains the reference to the same Mediator that is set up in the constructor. Other important methods are send and receive which implements sending message via Mediator instance and receiving message from Mediator broadcast, respectively. On the click of the send button message will be send to another component depending of selected recipient from the combo box. Simple Intent class represents wrapper for all messages. As you can see for now it contains only methods for putting string message and reading the same message. This class can be extended to wrap all other kinds of objects. Other classes from project are excluded from code preview since primary role of this blog was to present Mediator pattern. In a context of the project it is basically a simple desktop app developed using swing library. Mediator pattern is pretty common to meet in a different solutions. For instance, Android platform is using very similar principle regarding communication between Activities using Intent objects as messages that will be broadcasted to all Activity instances in the app. This way complex peer-to-peer communication is replaced by the Mediator who is in charge of distributing messages, providing loose coupling between components which is in the almost all cases very good practice. In this tutorial I'll demonstrate a way of linking your hybrid Android applications (Android native + HTML) with eBay web services. You can download file project source from here. 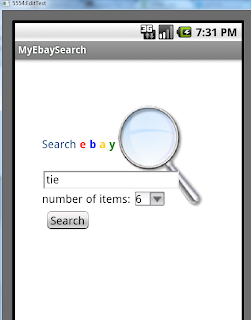 We'll create simple Android app with service client for searching eBay items by a keyword. After search is completed, application will list a correct number of items with their hyperlinks to details and images. 1. Search - offers eBay finding API that enables application to search for eBay items. These APIs give you a powerfull tools for developing e-commerce apps using integration with eBay web services. The same as in previous tutorial we'll develope hybrid Android application that is using native Java code for backend logic and HTML with jQuery for UI. In this sample, our application will contain two HTML pages. The first page will be search interface that has search keyword input and number input that represents a number of searched result items that will be displayed in second screen. 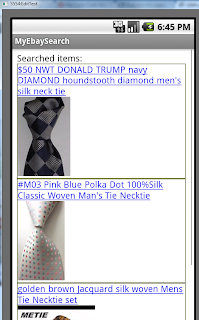 The second screen will display search results with item titles with hyperlinks and their images. 1. go on previous URL and click Join now section. 2. Fill in required data and register. 3. After you confirm your account, go back to web site and sign in. 6. 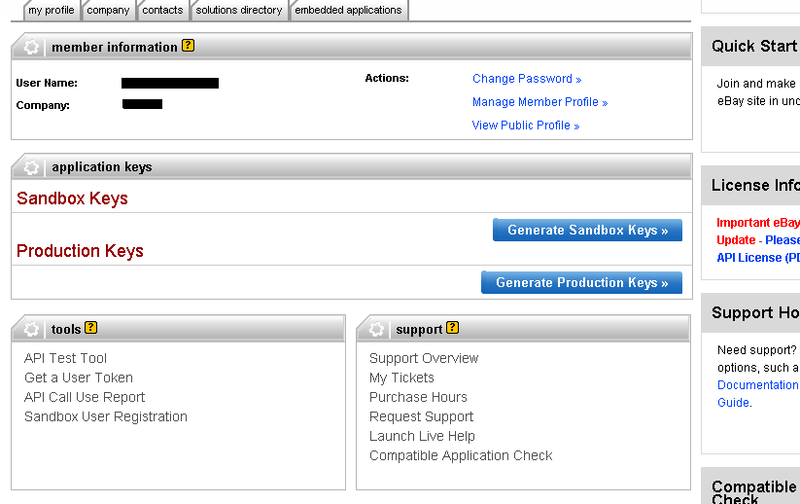 After you generate your keys you should get list of ids that will be used in your app configuration. Create new Android project in Eclipse environment - File -> New -> Android project, and choose target platform (in my case I used Android 2.1-update1). 1. After you created project enter AndroidManifest.xml and go to Permissions section. To establish link to eBay web service we'll need to write a client side class that is going to access eBay Finding service. In this case, we'll use REST-full eBay service and since these services are based on HTTP methods, we'll implement HTTP client to send HTTP requests to eBay service. In response, web service will send JSON object with items data as a search result. Remark: You're not limited on using REST-full services, their is also a way of using SOAP based eBay web services. In that case you'll need to use kSOAP2 project. SOAP services won't be covered in this tutorial. As we can see, this class contains single method getEbayItems that will retrieve search results. Notice in url string HTTP POST arguments. These arguments represents our web service call parameters. 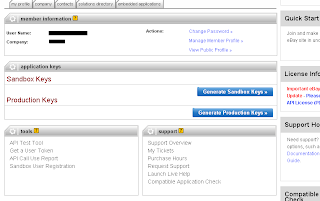 - In SECURITY-APPNAME you will enter your generated AppID key from Production keys section under your account at developer.ebay.com. - RESPONSE-DATA-FORMAT represents data type that web service will return in response (JSON or XML). - keywords is a search term. - and paginationInput.entriesPerPage represents item number in search result. If you set your parameters correctly, you will be able to see your JSON result when you enter this url in your web browser. In continue, we'll create simple HTTP client that will send HTTP GET request to eBay web service. In response it returns JSON result. 2. loadPage method is used to load page in WebView component using page URL and loadURL is used for running HTML page and jQUery in WebView. Basically, it re-encapsulates JSON arrays in result to get to item data. After we get our specific JSON Array with items data, we'll read their titles, image urls and url to details page. Don't get confused by replaceAll("[\"]|[\\|[\\]]", "") method. It is using Regex to remove redundant JSON characters - [" and "]. After we store JSON parsed results in class attributes, we load second page (searchitems.html) that is going to display search results. 5. onKeyDown method - overrides button "Back" functionality to go to previous HTML page. This HTML contains two input elements for input search term and select list for number of search items. JScript function sendSearchTerm reads values from input fields and sends that to Java callSearchService method. At a page load, $(document).ready function is called and Java getSearchedItems method gets executed. From this execution getResult function is called in callback and it will load results as innerHtml to "result" div element. Voila! You just created Android hybrid application with connection to eBay service. Through this tutorial I showed how to work with Android hybrid application using HTML and jQuery and how to expand Android functionality using web service clients. The purpose of this tutorial was to give some insights of working with web service clients and make your mobile apps a little more advanced. In this tutorial we'll develope a simple Andorid application using combination of native Android development, jQ.Mobi framework and HTML. Application sample can be downloaded from this link. This very simple aplication will contain two HTML pages. 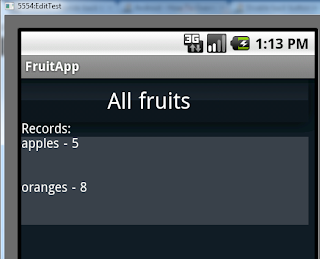 First page will be used for saving fruit data in Andorid SQLite database and the second page will show all fruits from database table. First, create a new Andorid project in Eclipse. After that, create a new package where we'll add some classes for database access. Create a new class named DataSQLHelper that will extend SQLiteOpenHelper class. String sql = "CREATE TABLE " + TABLE_FRUIT +" ( "
After creating first instance of this class, SQLite will create new database called "fruitapp.db". Method onCreate(SQLiteDatabase db) will add table "fruit" to previosly created database. FruitEntity class is used as a representation of database table. Another class called DBRepository contains methods for inserting fruit data in "fruit" database table - insertFruit(String dbtable, Context context, FruitEntity fruit). It also contains method getFruits(String dbtable, Context context) which returns JSON String representation with all records from "fruit" table. For purpose of parsing JSON objects in this sample was used Jackson JSON processor. Override method onKeyDown to define event on click of back button. In our case, default behavior is to go to previuos page. 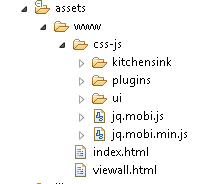 In folder css-js add exported files from downloaded jQ.Mobi archive. In folder www create new "index.html" page. In this case, it was used HTML 5, but you can use any version of HTML. 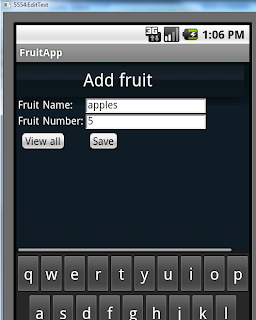 saveFruit function reads values from input fields and use it as arguments in Java method addNewFruit call. Notice that for Java method calls, we use interface that we added before in our Activity class. goToAllRecordsPage function redirects to next page. clearFields function clears values from input fields. In folder www create another HTML page called "viewall.html". Again, in the "head" tag we add css and jQ.Mobi libraries. In body part, add an unordered list element that will be used to display fruit data.